You know the rest of the saying, and what started out as a not-so-great experience had, by Friday, August 16, turned into a very good thing that was about to come to an end. But in keeping with the tradition of saving the best for last, there was plenty of fun packed into our last day at sea. We slept late then hit the main dining room for the sea day brunch. 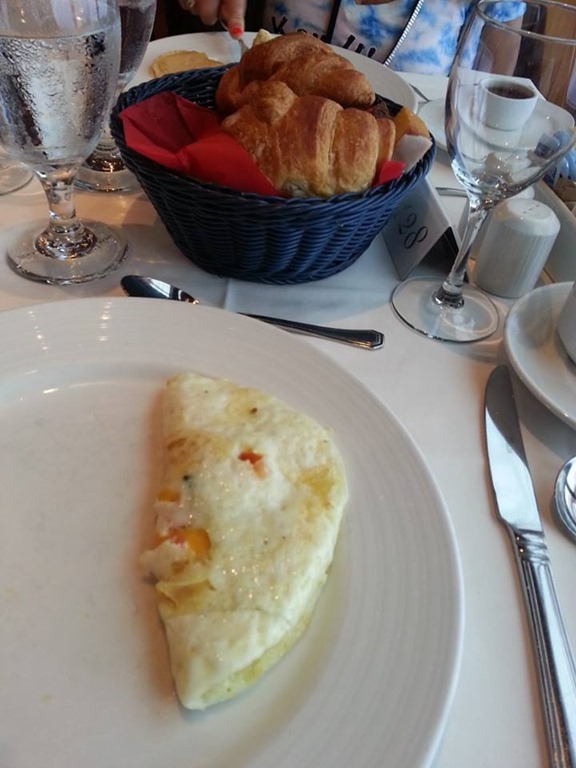 I stuck with my tried-and-true egg white omelet, but this time I did indulge in a couple of croissants. This was my first time to dine in traditional cruise fashion, seated at a large round table with a bunch of people we didn’t know. I wasn’t sure how I felt about that, but it turned out to be an interesting conversation since one of the ladies at our table had been on the Triumph’s so-called “cruise from hell” the previous February. It seemed telling that here she was, on another Carnival cruise. And her story contradicted much of what I’d heard in the mainstream media from passengers who were obviously looking to cash in with a lawsuit. The experience she recounted sounded a lot more realistic. Sure, passengers were inconvenienced but she described it as “like camping out in the ocean.” According to her, there was never really a shortage of food, the overflowing toilets that were the subject of so many news stories were only here and there, and she felt the compensation she received – a full refund, a free future cruise and $500 – was reasonable for her trouble. After breakfast, we hit the promenade deck to check out the last-day sales at the shops, where Sharon ended up buying a watch for herself and I snagged a “blingy” one for Tom. I also ordered my Sheridan to be delivered to the room that evening and bought some rum cakes to take home. A surprise (for me) feature of the last day was the chocolate buffet. I’m a sucker for good chocolate, and they had some seriously good chocolate concoctions that day. I had been good (calorie-wise) all week, so I was giving myself this one diet to totally break the diet – and I couldn’t have picked a better day for it. The challenge was choosing which to try. I’m afraid my eyes were bigger than my stomach, as I couldn’t eat all I got – but I did get a taste of each, and they tasted as good as they looked. We did a light lunch on the Lido deck (I needed something to get that sweet taste out of my mouth). They had spanokopita, which I love, so I couldn’t pass that by although, again, I wasn’t able to finish it all. Later that afternoon, we went to deck 4 to look for our photos from the evening before. I hadn’t had professional photos taken of me since the early 1990s, so I couldn’t resist. I bought a bunch. Since it was the last day, we spent some time packing our bags so they would be ready to put out for the porters, before getting dressed to head to the Steak House specialty restaurant for our farewell dinner. In this regard, we definitely did save the best for last. Service was wonderful, the atmosphere was magnificent and the food was fantastic. We got a window table (without even asking) and got to see the sun setting over the sea as we dined. It doesn’t get much better than that. I had already perused the menu, which is posted just outside the restaurant, earlier in the week, so I thought I knew what I wanted – but once again, choosing between several delicious-sounding appetizers and entrees wasn’t easy. However, when I found out the listing for “grilled fillet of fish from the market” was, in fact, Chilean Sea Bass, there was no contest. I ordered that, along with the New England Crab Cake as an appetizer and creamed spinach as a side dish. Sharon – who had wisely been eating what she wanted all week and didn’t feel the need to gorge on the last day – chose the surf and turf (and gave me her lobster – score!) with a baked potato and a Caesar salad. Before our orders were delivered, though, we were treated to the most yummy rosemary bread, along with tiny “chef’s surprises.” That bread was so good that we both had to hold ourselves back from filling up on it completely before dinner came. I confess that I am a bread aficionado, and this was right up there with the best I’ve ever tasted. The appetizers came next, and my crab was somewhat small (which was actually a good thing) but tasty, whereas Sharon’s salad was huge. The real fun began, though, with the entrees. My sea bass and Sharon’s donated lobster tail were both done just right. The creamed spinach was also very good. Sharon seemed to enjoy her filet mignon, and her potato was, again, enormous. She didn’t finish it, but she said it was good. We weren’t quite done yet, though. The $35 per person charge for the Steak House also includes dessert. And the desserts offered by the Steak House on the Magic are nothing short of magical. Sharon got the chocolate sampler, made up of four small cups of different layered sweet-tooth-satisfiers, and I got the hazelnut cheesecake, a slice of which was equivalent to half of a normal cake. Together, we only polished off about 1/3 of it, but what a taste sensation. That night, I paid for overdoing it; for the first time in all our days at sea, I woke up in the middle of the night feeling a little nauseous, and I don’t think I can blame it on sea sickness. Luckily, it passed pretty quickly, and it in no way undid what had happened to me over the previous week: I had turned into a confirmed cruise junkie. The next morning, debarkation went smoothly and we were soon back on the road to DFW. It was great to get home and see my three spinning Chins, who were thrilled to see me, and to fill my husband in on all the details of my adventure (though he, and many of my 600+ friends, had been following along on my Facebook posts and cruising vicariously through me). I was convincing enough that he told me to go ahead and sign us up for a cruise together, and it just so happened that my cousin, her two sisters and their husbands were all planning to go on a 5 day sailing in October. Wanting to be sure he enjoyed himself, I booked us a suite, and we started counting down the days.